Discussion in 'Announcements' started by owlbear, Dec 23, 2017. 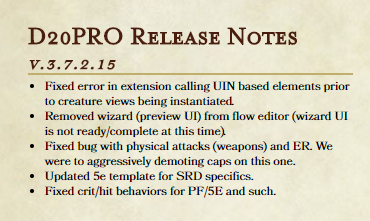 At long last, the full 3.7.2 release for D20PRO is ready for mass consumption. There are still a few kinks to work out with the recent OSX security updates, but the vast majority of the system is ready for prime time! A vastly overhauled back end for features and traits library. 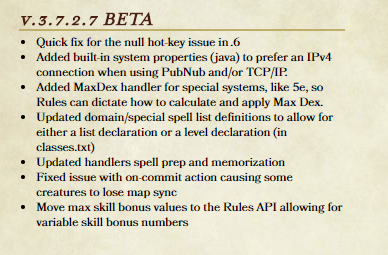 This includes all aspects of the Rules Library. Overhaul of the lighting engine to increase performance allowing for a large number of simultaneous light sources. Improved light editor allowing for lights to be displayed as images of your choosing. Tethering for markers so you can attach a marker to a creature token. 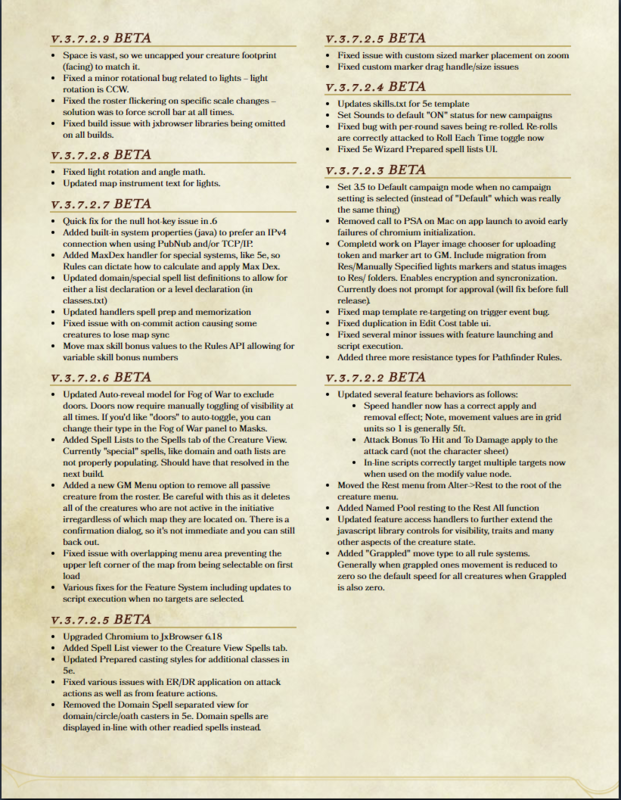 Initial support for a Starfinder rule set. This is an open source version of the rules suppling mechanical bits and no rules specific elements. Extensions web engine. At this point the Extensions system is a stub for the upcoming web-extensions API which allow external applications loaded in the Extensions panel to communicate directly with D20PRO and share data. Lets go over some highlights and examples shall we? From the Draw Tools->Fog of War->Light tab, you can now edit a light and set a custom image. Any png or jpg file can be used to decorate a light source. It is highly suggested that you pre-build the image with any transparency you want, as we do not currently have tools exposed to control the transparency of the utilized image. The effects that can be achieved with this add-on are pretty cool, however, keep in mind that if your art is not transparent in places the map will be occluded. GM (on the left) and Player (on the right); Example of views of opaque images with transparency effects attached to light sources. Similar to Lights, markers can accept arbitrary image maps. This isn't a new feature for markers. What is worth noting about markers, however, is that they can accept animated gifs as images. 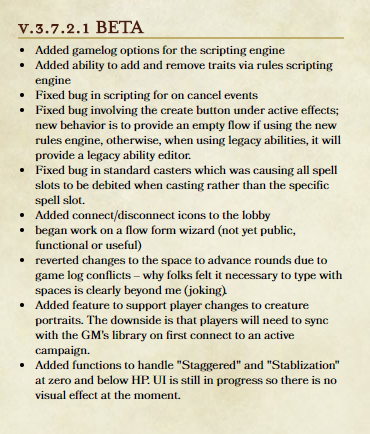 To use this feature, you need to ensure that the GM updates their library of markers with the gifs that your group would like to use prior to hosting the session. Once connected, anyone who has access to a create a marker can access the gif so long as it's attached to a preset. Wait, presets? what's that? Well, while we were working on the right click context menu for general map use (see below). 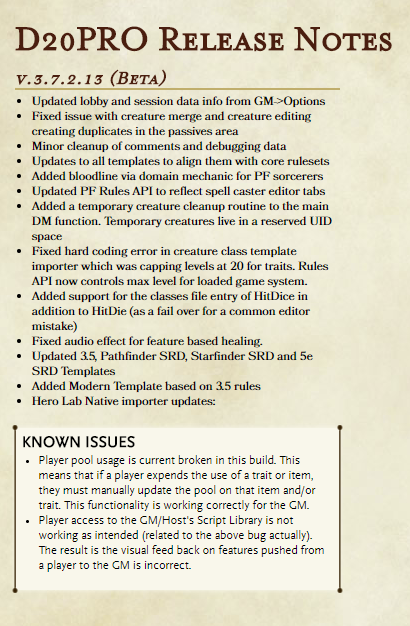 We realized it would be super handy for players to be able to access a library of marker presets defined by the GM. 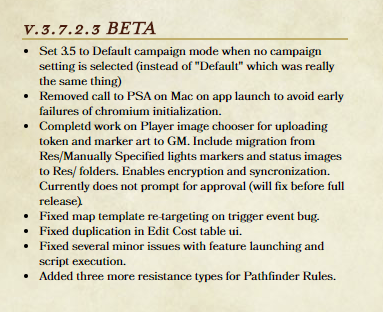 This lets players choose to add markers to the map from a list of defined markers that the GM hosts. It's as simple as that; Right click on the map, selected Place Marker->Create Preset and the Marker editor will come up with Preset type populated auto-magically. Light lights, you can click the Tether/Owner entries to select a creature to attach a marker too. Once attached, the marker will following the create as soon as their token is moved. There's a known bug that require the GM to wiggle (move but can place back) a token to get the initially placed marker to attach. This will be resolve soon in the next update. Anyway, once a preset is made, the player can select it from their right click context menu as so! This will let players place markers and have ownership of them such that they can tag creatures, place aura's or magically effects (fairy fire) on tokens and the like -- Fun! Tethered markers follow all of the normal rules for markers and can exist above fog of war, below fog of war or below creatures. Apparently AVAST is categorizing anything with built in browsing capabilities as a potential trojan-horse-type virus. 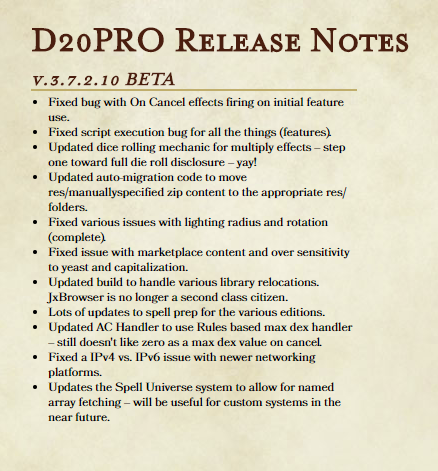 D20PRO, as of 3.7.1 and definitely the 3.7.2 release, include Chromium built in to handle new UI elements as well as actual web-site integration. We have gone out of our way to ensure the build is secure and does not actually contain any viruses. Win32:Evo-gen [Susp] is a broad classification used by the Avast Behavior Monitor feature for software that exhibits suspicious behavior categorized as potentially malicious. The Behavior Monitoring feature observes the behavior of processes as they run programs. If it observes a process behaving in a potentially malicious way, it reports the program the process is running as potentially malicious. Is Win32:Evo-gen [Susp] a False Positive? Files reported as Win32:Evo-gen [Susp] are not necessarily malicious. For example, users can be tricked into using non-malicious programs, such as Web browsers, to unknowingly perform malicious actions, such as downloading malware. Some otherwise harmless programs may have flaws that malware or attackers can exploit to perform malicious actions. Should you be uncertain as to whether a file has been reported correctly, we encourage you to submit the affected file to https://www.virustotal.com/en/ to be scanned with multiple antivirus engines. In most cases, Avast users are trying to download pirated software, and the Avast Web Shield will pop-up with the “Suspicious file blocked!” alert. Please be aware this is in the unstable branch. But needs hammering on and feedback prior to going full beta.